Two things really stood out about my first week of work. First, it rained a lot, which meant I wore my Kate Spade rainboots for most of it. Second, getting up early and undergoing endless hours of training was a lot more exhausting than anticipated. As discussed in Tuesday's post, most days I went for easy, comfortable outfits that I was sure would work. This is one example of a surefire outfit combination that I fall back on when I can't think of anything else to wear: a cardigan over a top, skinny jeans, and boots. 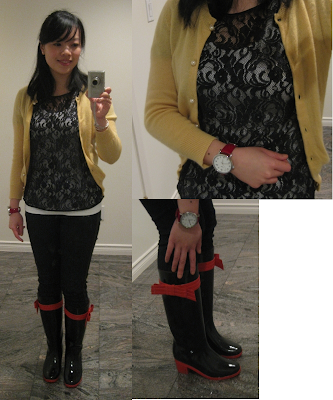 I like how the dashes of red in the rainboots' bows and the watch strap add colour along with the yellow cardigan, while the pearl buttons on the cardigan and lacy pattern of the top provide points of visual interest. It proves that "easy and comfortable" doesn't necessarily equal "boring." i looooove your kate spade boots!! love red and navy blue together.. it's so classic but cute at the same time! love how you styled the lace to make it day and work appropriate too! Love the lace top! I'm actually wearing one today to work haha! What a great work outfit! Those wellies are beyond adorable... I love the red bow! And the lace tee is great too. nice work ensemble, and nice that you're taking your kate spade boots out for a spin! they look sooo cute. have a great weekend! I just love those Kate Spade boots. I saw them on sale and didn't pull the trigger. Totally regret that! I like the lace with the yellow, I'll have to try that some time! And obviously your boots are amazing (and so perfect for these dreary days!) Hope your new gig is going well. I forgot to ask you when I ran into you! holy smokes kate spade rain boots!! love red and yellow - very peppy for our dark winter skies. i'm totally with you these days on the comfort thing. with a new puppy it's hard to get too dolled up without a serious risk of puppy ripping! Your rain boots are super cute!